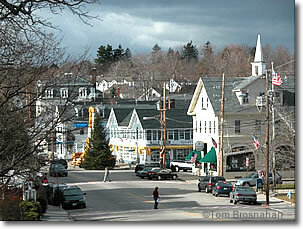 Wolfeboro is one of the prettiest towns on Lake Winnipesaukee, with lots to see and do. Dr Henry F Libby, a Boston dentist who was born and raised near the shores of Lake Winnipesaukee, devoted the latter part of his life to the study and collection of natural history specimens: fish, animals, and birds. Around the turn of the century Thomas Gustave Plant (1859-1941) decided to build a retreat in the Ossipee Mountain range of the New Hampshire wilderness for himself and his wife, Ms Olive Plant. While he was not alone in this—lots of rich men were building lavish estates in the region—his accomplishment, finished in 1914, is certainly among the grandest. The Arts and Crafts-style mansion was designed by J Williams Beal & Sons of Boston, cost millions of dollars to build, and was named Lucknow after a castle in Scotland. The name comes originally from a city in India). Today Lucknow is called Castle in the Clouds, and is owned and operated by the Castle Preservation Society, a non-profit organization. The 135-acre estate's grounds are beautiful, and the view of the mountains and lakes is nothing short of spectacular. The remaining 5,245 acres (2,123-hectares) of the lands once owned by Thomas and Olive Plant are under the control of the Lakes Region Conservation Trust. Hiking trails, 28 miles (45 km) of them, wind through the estate; horseback trail rides, pony rides and horse-drawn carriage rides are daily events. Castle in the Clouds features the Carriage House Restaurant, Cones in the Clouds ice cream shop, and a gift shop.